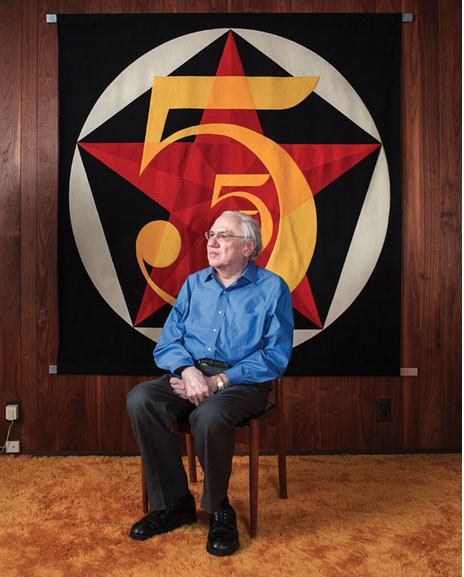 Jay T. Last ’51 is considered one of the “fathers” of Silicon Valley. In 1957, he was one of the group of eight who founded the Fairchild Semiconductor Corporation. At Fairchild, he worked on developing the first commercial silicon planar transistors and directed the research and development group that produced the first integrated circuit chips. These devices are the lifeblood of the modern computer. Fairchild helped establish Silicon Valley as a center for technological innovation and entrepreneurialism and is credited with inventing the technology that drives the computer industry today. In 1961, Last left Fairchild to start Amelco Semiconductor as a division of Teledyne, Inc. A few years later, he became the vice president of technology for the parent company in Los Angeles, overseeing the technical interaction of Teledyne’s steadily increasing number of divisions. Last’s interest in the history of lithography extends to his own independent scholarship. He is the author of The Color Explosion: Nineteenth-Century American Lithography and the coauthor, with Gordon McClelland, of five other books focusing on California themes. He is a founder and member of the board of directors of the Archaeological Conservancy, a national nonprofit organization established in 1980 to preserve archaeological sites in the United States. In 1999, Last received the Hutchison Medal from the University of Rochester, and he won the 2005 Maurice Rickards Award from the Ephemera Society of America for his important contributions to the field of ephemera studies. In 2007, he received the Newman Award for the outstanding book of the year for The Color Explosion. Last received a BS in optics from the University of Rochester in 1951 and a PhD in physics from MIT in 1956.